University of Arizona researchers have found in a recent study that ultrasound waves applied to specific areas of the brain appear able to alter patients’ moods. The discovery has led the scientists to conduct further investigations with the hope that this technique could one day be used to treat conditions such as depression and anxiety. 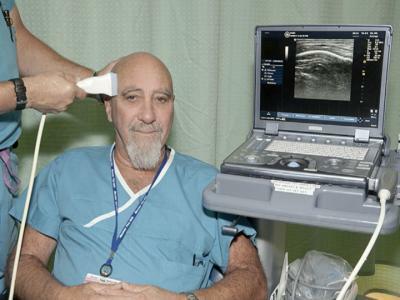 Dr. Stuart Hameroff, professor emeritus of the UA’s departments of anesthesiology and psychology and director of the UA’s Center for Consciousness Studies, is lead author on the first clinical study of brain ultrasound, which was published in the journal Brain Stimulation. Hameroff became interested in applying ultrasound to the human brain when he read about a study by colleague Jamie Tyler at the Virginia Polytechnic Institute, who found physiological and behavioral effects in animals of ultrasound applied to the scalp, with the waves passing through the skull. Hameroff knew that ultrasound vibrates in megahertz frequencies at about 10 million vibrations per second, and that microtubules, protein structures inside brain neurons linked to mood and consciousness, also resonate in megahertz frequencies. Hameroff proposed testing ultrasound treatment for mood on human brains. “I said to my anesthesiology colleagues, ‘we should try this on chronic pain patient volunteers. '” His colleagues respectfully suggested he try it on himself, first. Hameroff acquiesced. After 15 seconds with an ultrasound transducer, a standard ultrasound imaging device, placed against his head, Hameroff felt no effect. His mood was elevated for the next hour or two, Hameroff said. Aware that his experience could be a placebo effect, an imagined effect derived from his expectation to feel a change, Hameroff set out to properly test the treatment with a clinical trial. Patients reported improvements in mood for up to 40 minutes following treatment with brain ultrasound, compared with no difference in mood when the machine was switched off. The researchers confirmed the patients’ subjective reports of increases in positive mood with a Visual Analog Mood Scale, or VAMS, a standardized objective mood scale often used in psychological studies.